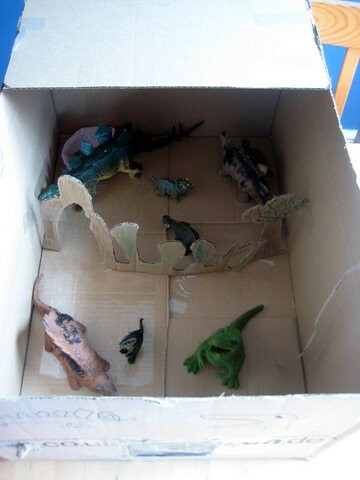 How to make a junk model dinosaur world by our resident paleontologist Miss B.
I love it when B heads off with the making box and reappears an hour later with a creation. This week she made a dinosaur land, with lots of added details I would never have thought of – but then she is the chief dinosaur keeper round here. 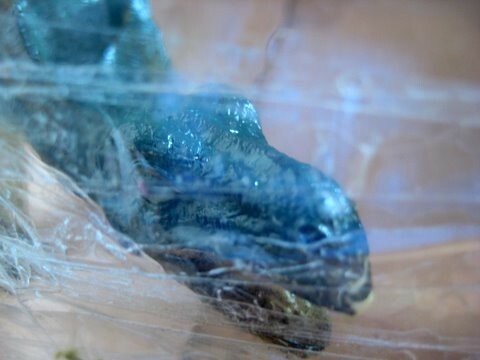 If you’ve got any dinos living in your house in need of a new enclosure, you might like to include some of B’s tips for making your dinosaur happy. The first tip from our dino ranger is to make your enclosure nice and big with lots of interesting features for your pets to explore. Include lots of vegetation for your dinosaurs to snack on. Add a feeding panel which you can open from the outside with a handle – so you can feed your dinosaurs without becoming a meal yourself. A viewing panel lets you observe your dinosaurs to check they are happy and healthy. 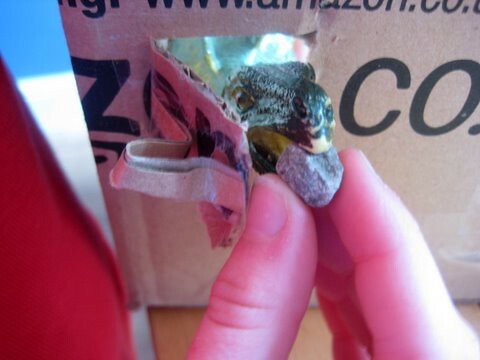 Have you got a big cardboard box you could make something with this week? 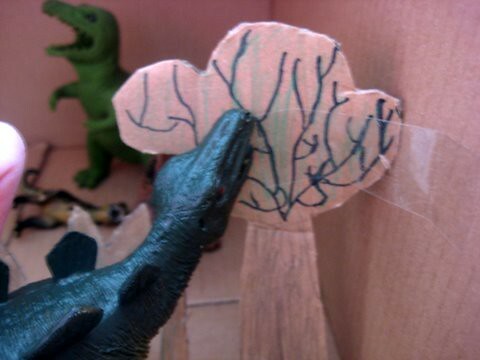 That is one creative kiddo you’ve got there…looks like those dinos are in good hands! Jurasic Park eat your heat out! Great idea. lots of dinosaur play going on here to as one little boy i look after is Dinosaur mad! Thanks pip. Most kids I know seem to be dino mad – I wonder what it is about them that captures their interest so much? That is so creative of your kid! My daughter will love it! She is a great fan of Dinosaur Train TV program and She likes T-Rex Dinosaur lot! Sad thing is we don’t have dino collections. May be its time to buy some! Wonderful! This week and next is a dinosaur study at our house! I am going to show this to my little guy! Mary – hope he likes B’s ideas! My kids would love to have that BIG cardboard box. 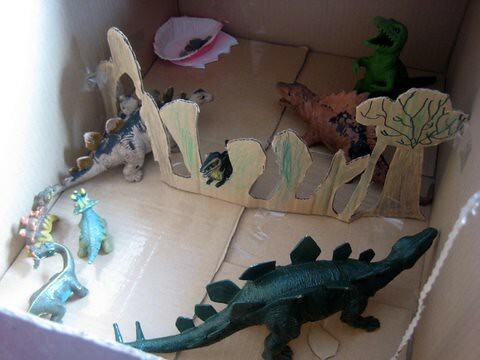 I love the dinosaur habitat they made. All kind of habitats are so much fun to make, but I can’t seem to get my boys into them! This dinosaur world is sooo cool! My daughter would love this! oh thats fantastic ! i am so helping my son to make a similar one after school ! Love the details…she certainly loves her dinos!! Very creative! 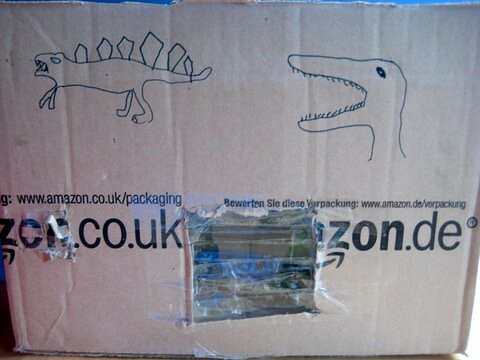 I will have to show my boys pictures of this dinosaur box. I am sure it will give them some ideas for their animal habitats they love to create. Hehehehe LOVE the dinosaur feeding photo! Brilliant! And very good fun. Great to see your girls enjoy their dinosaurs too! Fab! There is something so special about the lure of dinosaurs over small children 🙂 What a wonderfully creative dinosaur play world.